Incidentally Zappa met the former singing duo of The Turtles, Mark Volman and Howard Kaylan. They had visited the Zappa concert in the L.A. Pauley Pavilion with Zubin Metha conducting the L.A. Philharmonic. They were in legal conflicts with their manager and other band members and in a difficult working position. The contracts ruled out that they could perform as The Turtles; they even weren't allowed to use their own names as name for a duo. Zappa offered them an opportunity to work with him and they chose to call themselves the Phlorescent Leech and Eddie, mostly shortened up as Flo and Eddie. They made their first appearance on "Chunga's Revenge" (1970). In 1970 Zappa was busy forming the second line up of the Mothers of Invention and restarted touring. To give this band some new material of its own, "Chunga's Revenge" was released with a mixture of studio and live music. The album contains some more accessible material with for instance a traditional blues piece "Road ladies", the relaxed "Sharleena" and a riff-based song called "Tell me you love". Right: FZ, ca. 1970 (source unknown). a) A-Bb-C#-D-E-F-G (the F is present in the preceding bars). Because of the ongoing D chord and a secondary E in the bass line, the A of the bass at this point loses much of its function as a tonic for the whole. The first scale is a gypsy type one with an augmented second (Bb-C#), the second is a self-created one. 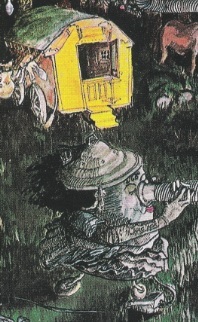 It's thus likely that this reference to the gypsy scale is also responsable for the title of the song and the gypsy scene on the inside album cover by Cal Schenkel (outtake to the right). Transylvania is a region in eastern Europe and most European gypsies live in eastern Europe. The vacuum cleaner from the album cover returns in "200 Motels" and the 1970 VPRO documentary, where it's shown how it can be used for "stimulating pies" (televised on Dutch TV). Here the augmented second happens with Ab-B. The bass continues with A natural, thus it's getting a bit chromatic here. A lot more so when this theme gets harmonised. Then it's thus chromatic that you can't relate this version of the theme to a certain scale anymore. Transylvania boogie (Ahead of their time), themes (midi file). Transylvania boogie (Chunga's revenge), opening (midi file). Transylvania boogie (Ahead of their time), themes (transcription). Transylvania boogie (Chunga's revenge), opening (transcription). - 0:00 First block beginning with a variations upon theme I from above in bars 1-4, also beginning with a A-Bb-C# movement. Next Zappa continues to improvise in this gypsy type key. In bar 9 the G gets altered to G# and in bar 11 the D becomes D#. By adding these chromatic ingredients, it's becoming an even more exotic type of scale. 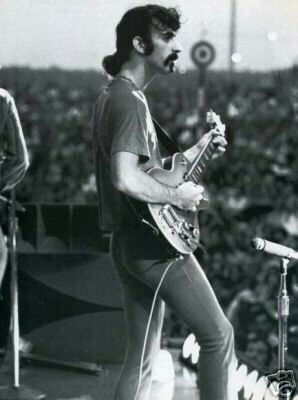 In bar 13 Zappa turns over to A Mixolydian with bass and keyboard forming the I chord. It can also be interpreted as E Dorian because the weigth of the bass line here lies on E. During most of the song it's A pedal. The D and G become natural again in bars 15 and 17. The F# from the A Mixolydian scale only first turns up at 0:41, not included in the transcription from above. Other than on "Ahead of their time" the band is playing in 4/4 for the larger part of the song. - 1:57 Second block with theme II returning mostly identically. - 2:05 Third block with theme III with extensions. - 2:38 Fourth block with Zappa continuing to solo in A Mixolydian. "Road ladies" is a blues-based song with a solo in D Dorian. In the album liner notes Zappa calls all lyrics from "Chunga's revenge" a preview of the story from "200 Motels". Only "Road ladies" is directly related to the eventual "200 Motels" movie. Since not all scenes could be filmed, it's possible that other titles from "Chunga's revenge" are related to the movie script as well. It's certain that this applies to songs from the next "Fillmore East" album, but these didn't make it to the movie neither. "Twenty small cigars" stems from the preceding Hot rats sessions, dealt with in the corresponding section. It couldn't be included anymore in the "Hot rats" album, but the quality of this composition required an appearance elsewhere. Zappa decided not to record it anew with his new band, but to include the track as it was captured at first. - 0:00-1:40 = 8:11-9:51 from Road tapes #3, disc I, track 12. - 1:40-2:41 = 7:20-8:20 from disc II, track 12. - 2:42-5:44 = 10:07-13:08 from disc I, track 12. - 5:45-9:27 = 15:17-18:59 from idem. The Nancy and Mary music, 4:09 till 4:33 (midi file). The Nancy and Mary music, 4:09 till 4:33 (transcription). This example contains most of the joint sax and guitar improvisation, that starts at 4:00. At bar 11 the sax stops and the guitar continues with a solo. The bass is playing around an Eb pedal during bars 1-10. Next the bass continues with a one-bar-vamp during the beginning of the solo. The example from above corresponds with 11:33-11:57 minutes from Road tapes #3, track I.12. The emphasis in these bars lies upon playing around Eb at first, followed by ticking the Ab as 16th notes. From bar 15 the solo continues in a standard manner. - 0:00 Theme two from the live performances of "King Kong" (see the Uncle Meat section of this study at "Uncle Rhebus"). - 0:24 Igor's boogie, phase one (see the Burnt weeny sandwich section). - 1:38 Little guitar theme in Eb Dorian, as introduction for the solos. Road tapes #3, I.12, 2:00 till 2:19 (midi file). Road tapes #3, I.12, 2:00 till 2:19 (transcription). This guitar theme is a sequence of four bars in 4/4 in Eb Dorian. It gets repeated twice, the second time transposed up a fourth from Eb to Ab as starting point. This is where the transcription from above begins. Bars 1-4 are the second repetition of the sequence. Bars 5-7 contain the opening of the seguing guitar solo. As it comes to compositions, the new Mothers started where the earlier Mothers had stopped. The sound of the band on "Road tapes #3", however, goes pretty differently. 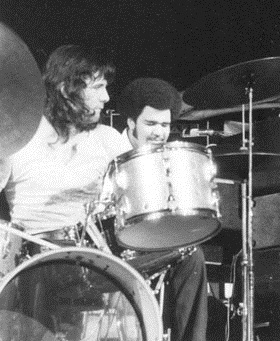 It's more dense with George Duke on keyboards and especially Aynsley Dunbar on drums (photo to the right). Zappa described him as sounding like two drummers. Even so things would change again soon when the groupie opera got constructed during the 1970 fall tour. So, as more often in Zappa's career, "Chunga's revenge" and "Road tapes #3" are in their character and sound specific of only one year of recording and touring. - 2:12 1st Guitar solo. - 5:08 1st Sax solo. - 8:12 2nd Sax solo. - 10:24 Extravaganza by the band and audience participation. - 11:24 Joint improvisation by the sax and guitar. - 11:50 2nd Guitar solo in Eb Dorian. - 13:09 Guitar chord progression, followed by a keyboard solo. - 17:21 More extravaganza by the band and audience participation. - 0:00 Theme from Chunga's revenge (see below at track 7). - 11:12 Reprise of the theme. - 12:17 Applause with the "Mondellos" thanking the audience. It's all "Chunga's revenge" during the latter track and not "The clap" as on the album, but possibly this was the original working title. Two stills from the Uncle Meat movie, 1970 takes. 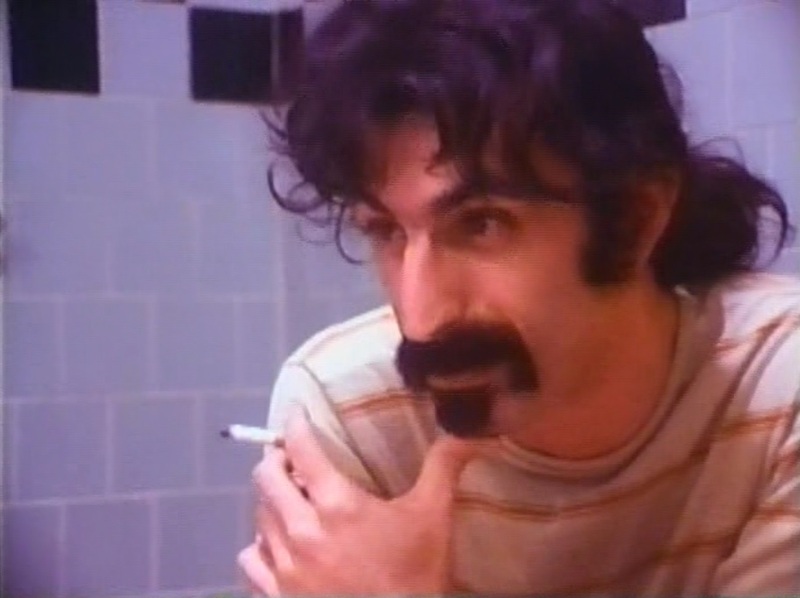 Left: Zappa telling of his problem of how to shoot continuity shots when he couldn't get hold of the original Mothers with only a week of filming time. It got solved in a way by improvising things on the spot, like the scene at the right, with Phillis Altenhaus and Aynsley Dunbar at a supermarket near Zappa's house. "Tell me you love me" begins with a catching guitar riff in F sharp Dorian that by itself, I think, has some "hit potential", but maybe Zappa is using too many themes and variations in "Tell me you love me" to turn this song into a hit. Tell me you love me, opening (midi file). Tell me you love me, opening (transcription). 0:21 Side theme 1 ("I love you so hard now"). 0:24 Side theme 2 ("Don't make me lose my pride"). 0:30 Side theme 3 ("Grab a hold of you"). 0:37 Theme A, variation 1. 0:53 Side theme 1 ("I want to feel it"). 0:57 Side theme 2 ("Don't make me steal it"). 1:37 Side theme 1 ("I love you so hard now"). 1:40 Side theme 2 ("Burning with fire"). 1:46 Side theme 3 ("Cause I gotta make love"). 1:59 Instrumental outro, first played as intermezzo. 2:11 Theme A, variation 2. 2:23 Instrumental outro as final. 6. Would you go all the way? All five songs with lyrics on "Chunga's revenge" can be called regular pop-songs. "Road ladies" is blues-like, "Tell me you love me" is rock 'n roll for its central lick. The other three on the album - "Would you go all the way? ", "Rudy wants to buy yez a drink" and "Sharleena" - (also) belong to mainstream pop. "Sharleena" could be called a ballad as well. As it comes to their lyrics, all tracks on "Changa's revenge" are for Zappa standards mild. The same goes for "Tears began to fall" on the next "Fillmore East" album, while everything else on that album goes into different directions. The bass riff from "Chunga's revenge" was used for soloing during jam sessions with the new band in the studio. The album has Ian Underwood on distorted electric alto sax and Zappa on guitar. One of the recordings was used for experimenting with four track surround audio, today much used in cinemas. Several other of such mixes were done in the seventies and the Zappa Family Trust (Dweezil in this case) released them as the "Quaudiophiliac" DVD of 2004. The "Chunga's basement" version of "Chunga's revenge" from "Quaudiophiliac" is included in the next section. Zappa referred to this technique with his line from "Camarillo Brillo": "she said her stereo was four way". The relatively short theme from "Chunga's revenge" was used in the eighties for introducing a longer guitar solo as present on "Buffalo" and "Trance-Fusion". Chunga's revenge, theme (midi file). With D being the lower opening note of both bar 1 and the riff, plus the central note of the main theme, the key is D Dorian. Bar 1 does the progression I-I-IV. Bar 5 incidentally begins with an F, bar 6 continues with the bass lick as it keeps being repeated. In bars 9-10 Zappa shortly lets some altered notes come passing by. In rock terms the progression here is Asus4-Dm-Asus4-Ab. It's followed by two bars stressing just the G. Next the riff returns and the soloing can start. To the left part of the Zappa photos by John Williams for the backside CD cover. Zappa as a multi-instrumentalist comes out the best on "Zoot allures" from 1976, playing guitar, bass and keyboard. On "Twenty small cigars" he's playing the melody of this piece on harpsichord, next to the piano part by Ian Underwood. Zappa started his musical career as a drummer, but recordings with him sitting behind a standard drum-kit are rare. Only some of the tracks from the Cucamonga period feature him as a drummer. Here he's using a large number of percussion instruments, next to the regular drum set. Playing percussion is something he occasionally did. Like the duet with Jimmy Carl Black on "YCDTOSA vol. V" or the "Roxy, the movie" DVD from 2015, where you can see him playing along with Ruth Underwood. Zappa's interest in drumming and percussion took a new turn when he obtained the synclavier, where he had to type in drum parts himself again. His final work, "Dance me this", contains a number of passages from what he himself called "The rhythmic sadist's guide to drum patterns for the 21th century". It's a fascinating world, difficult to come to terms with. Melodic examples from this CD can be found at the end of this study. "Rudy wants to buy yez a drink" is a three-theme popsong with an instrumental interlude in it as bridge. Specifically this interlude has some vaudeville elements in it. The song was played live during the 1976 tour as included on the ZFT "Philly '76" double CD. Next are sections from both albums. - 0:00 Instrumental opening progression in C, played twice: C-Am-Dm7-G. The transcription below starts with the repetition of this progression. - 0:08 Theme I. The bass now changes the D from the previous progression to F, thus becoming C-A-F-G. The theme is sung twice, first as a single melody (bars 3-7), next with Flo and Eddie singing in parallels (bars 8-11). The first example below ends here. - 0:30 Coda of theme I with the chords G-F-G-F-G, thus like ending in G Mixolydian. The rhythm goes a bit syncopic. - 0:36 Theme II. The meter now changes to 12/8 in swing time (with no tempo change of a meter, thus a dotted quarter note being equal to a quarter note in the previous bar). This second theme is sung over a I-V alternation in F Lydian (or IV-I in C if you still want to interpret it as belonging to the central scale). - 0:51 Theme III. This theme can be seen as a variation upon theme I, in C again, sung over the same bass line notes. - 1:16 Instrumental interlude in C as presented in the second transcription below, played with some rubato. Its basis is a I-II alternation. - 1:35 Theme I. The bass once plays C-A-D-G as at the beginning of the song and next returns to C-A-F-G.
- 1:56 Theme I once more. - 2:11 Sung coda over the bass line G-F-E-D ("Now I go away."). - 2:20 Closing chords with Zappa mingling C and A minor. The progression is C-G-C, followed by G#m7-5 - Am7. Thus its tail is VII-I in A minor with the major 7th (G#). Rudy wants to buy yez a drink (1970), opening (midi file). Rudy wants to buy yez a drink (1970), interlude (midi file). Rudy wants to buy yez a drink (1970), opening (transcription). Rudy wants to buy yez a drink (1970), interlude (transcription). - 0:00 Instrumental opening progression with just the bass line from above with drum beats, C-A-D-G.
- 0:08 Theme I. Other than in 1970 the bass doesn't change the D to F, the progression remains C-A-D-G througout the song. Zappa first sings theme I alone. The bass is playing its notes in the manner of bar 1 in the transcription below with off-beat drumming. - 0:23 Coda of theme I as described above (bars 3-4). - 0:26 Theme IV. The meter now changes to 12/8 in swing time as above, but the sung theme goes quite different (bars 4-8). The transcription below contains the G Mixolydian tail from theme I, followed by a I-V alternation in F Lydian as in theme II as described above for the 1970 version. This is the section that seriously deviates from the 1970 version. In the other parts it's more the details that differ. The remainder of this version goes similar to my description of the 1970 version. Rudy wants to buy yez a drink (1976), section (midi file). Rudy wants to buy yez a drink (1976), opening (transcription). - 1:40 Theme I once more with Bianca Odin and Ray White now singing along with Zappa. The following example is another mainstream piece, the ballad "Sharleena" in G Minor (bars 1-4) and Mixolydian (most other bars of the transcribed part). It first appeared on "Chunga's revenge" and was recorded again for "Them or us", where Zappa's son Dweezil contributed with a guitar solo. Sharleena, melody sections (midi file). Transcribed here is the "Chunga's revenge" version. The opening theme moves over a downward going bass progression, the chords formed being subsequently Gm, F, Ebmaj7, Am7-5, Dm7 and G. The second transcribed theme below is made up of syncopic bars over a G pedal. "Sharleena" and "Tell me you love me" indicate the various ways Flo and Eddie can sing in parallels in Zappa's songs. You can see thirds, fourths, sixths and larger intervals going over an octave as a tenth in bar 5 of "Tell me you love me". Fifths turn up in the "Call any vegetable" transcription from the Just another band from L.A. section. In "Latex solar beef" (Fillmore East section) they are sometimes alternating each other, sometimes singing unisono. In the atonal part of "Billy the mountain" in this study they follow their own way. So the overall picture you get is that Zappa liked to employ the duet as really two singers.